Bright purple and brilliant white look amazing when placed perfectly on these 14k white gold hoop earrings with amethysts and pearls. The gorgeous glow of amethysts shine brightly when channel set on gold hoops made in your choice of 14k yellow, white, or rose gold. Ten princess cut stones are inlaid in each pair, making the surface of these earrings gleam brightly. 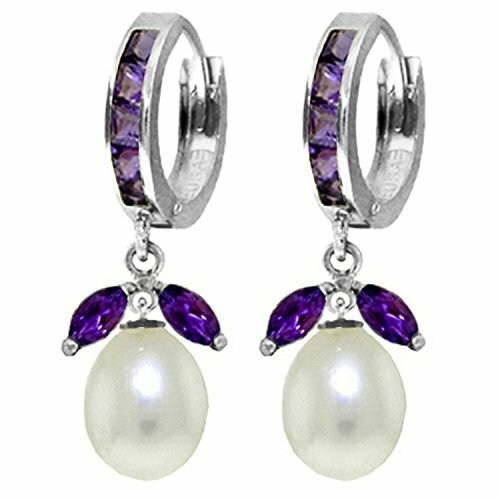 A pear cut pearl dangles beautifully below, adding a startling contrast to the two marquis cut amethysts that surround each gem. Over ten carats make up each pair of fabulous earrings, just the right amount for those who love sparkling natural stones.